Carousell has taken its relationship with Singapore Press Holdings (SPH), the country’s largest news publisher, to the next level. The Singapore startup has announced today a partnership with the Group’s magazines division to integrate its mobile marketplace on a whole slew of online magazines, including Her World and Her World Plus. The partnership involves creating a customized mobile app called SheShops Marketplace, which sells fashion and beauty items alongside other product categories. Like Carousell, the app allows users to list items they want to sell using their smartphones. Buyers can contact sellers through the service and arrange for pickup. The app was launched for the iPhone on 9 July, but didn’t appear to be heavily promoted. 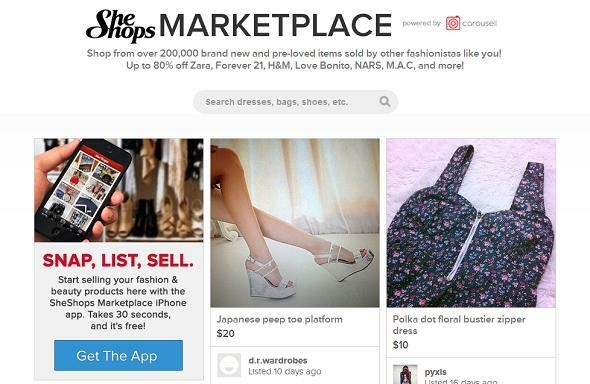 The public can also visit a web version of the SheShops Marketplace, which contains over 200,000 listings, directly through SPH’s online properties. Items that are posted on Carousell will be available on SheShops and vice-versa. According to the startup’s co-founder Quek Siu Rui, this arrangement, and any similar ones in the future, will not be its main source of revenue. This latest announcement is a follow-up to Carousell’s first partnership deal with SPH. In January this year, it made known its arrangement with STClassifieds, SPH’s main online classifieds business. Unlike its Pulitzer Prize winning counterparts in the West, SPH’s bottom line and circulation is still relatively healthy, bolstered by diversifications into the property and education business. However, the status quo may not remain for long. As such, it has begun making investments into the startup scene, buying out car classifieds company sgCarMart for USD 48M, investing in restaurant reservations startup Chope, and developing its own online products. The general trend, it seems, is towards a convergence between editorial and e-commerce. SPH and rival MediaCorp have begun experimenting with e-commerce and online retail, while e-commerce companies like VanityTrove, Zalora, and my Life Inc are using content marketing to reach more customers. The evolution is inevitable since print magazines have been placing ads in their pages for years. The online medium takes this further, shortening the distance between reading an article and getting readers’ hands on an item they’ve seen in the magazines. The post Carousell partners with SPH Magazines, marries editorial and e-commerce appeared first on SGE.